The apartment is in the historica center of Seville, 400 meters from cathedral. The apartment is in the heart of Seville, it is 50 meters far from El Salvador church, 250 meters far from Town-Hall of Seville and 500 meters far from the cathedral. It is a quite light and quiet apartment with a powerful aircondition. It is 50 meters square apartment. The living room has a huge large window that make it bright, there is sofa-bed for 2 people (single beds) and one folding bed for one people, TV and DVD. The kitchen has microwave, fridge, electrical stove and kitchenware. The spacious bedroom has an exterior window that makes it light, there is a double-bed and one folding bed for one people, there is a wardrobe too. It has a large bathroom with two washbasins and bath, the bide and toilet are separated by a door. 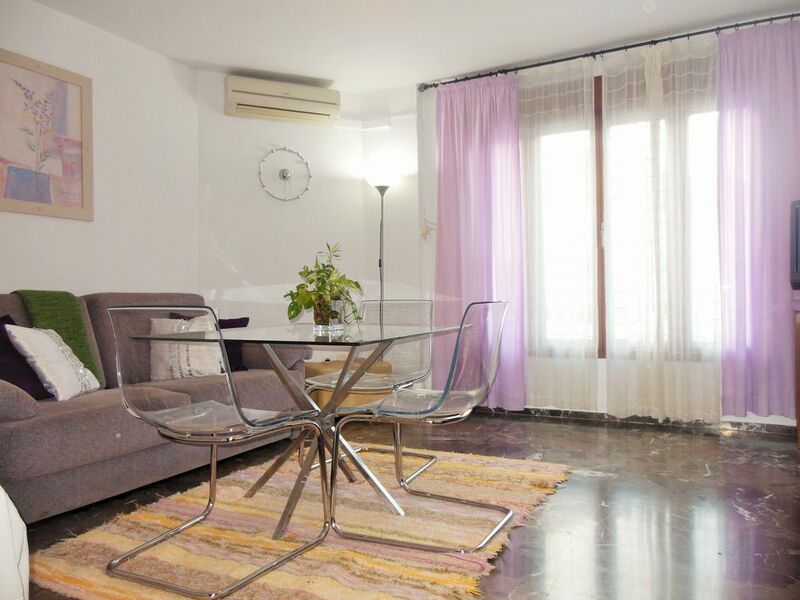 The apartment is in a private passage so you are in the heart of Seville but in a very quiet area. It has air conditioning and heating. Free wireless access to internet. Communal roof, we use it to hang clothes, sunbathe or using the table and chairs for meal in good company. The neighbourhood is very quiet because it is in private pedestrian street, however, 25 meters far is Sierpes street, commercial street full of shops, and 50 meters far is Plaza de El Salvador, lively square with bars and shops and the great El Salvador church (the second largest church of Seville after the cathedral). My name is Miriam. I live next to the aparment, every objetion or doubt that you could have will inmiediately be solved. Undoubtedly what all customers highlight is the silence of the apartment, being in the historic center of Seville. Nice apartment with everything you need. Great location near all the attractions. Hostess was very nice. Highly recommend. It was good to be situated in the centre, making it easy to get to visit places. The location is very good for most anything you would like to do in Seville. The roof top is a nice space to relax with a drink in the afternoon. The shower had very little water pressure and the couch was very difficult to sit on but great for a siesta. Thanks for your opinions, we consider them. The water presurre is the habitual one in Seville, you have to consider Seville is a city in a valley. We are modernizing the apartment little by little, our first changed has been the sofa. We have instaled a new leather sofá. I am delighted to know it is great for a siesta. Miriam is very nice and helpful. Her apartment is very good, really good bed, and a great location. I highly recommend it. Lovely, spacious, apartment in great location. Ideal location for exploring the sites of Seville. It's on 3rd floor of an apartment block (no lift ) in a passage between 2 busy shopping streets. It's in a lovely pedestrian area in central Seville, close to shops, bars, restaurants, but quiet at night. All the major sites are within walking distance. The passage is gated after around 10pm, so, if you arrive late, make sure you have details of the right button to push to get you in ! The apartment is clean and well equipped. The kitchen is small, but adequate, with 2 hobs, a washer and the usual equipment. The dining room is a good size as are the bedroom and bathroom. Miriam was very helpful and lives in the adjacent apartment. We stayed for 6 nights and really enjoyed our stay and would definitely recommend it. The apartment is in a central location within an easy walking distance of all the main attractions. Many good tapas bars and restaurants also nearby. The apartment met all our needs - although with the exception of breakfast we ate out all the time. The apartment is in the heart of Seville, so we recomend to enjoying with the city, walking, eating tapas, visiting historical monuments ... loving Seville.